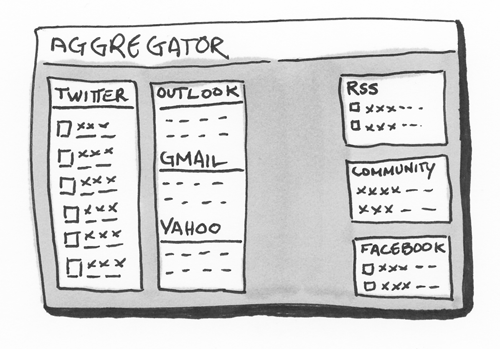 First attempt at sketching my aggregator idea. Over the past week I have been developing ideas for a personal project so I can continue to expand and grow as a designer. My first round of sketches were merely expressing and visually describing my idea. So what is next? Since it’s just for me (and to share with you, of course), I understand what my rough scribbles express. But I could not go to a client with how they look now, so I must honor the process and refine my concepts. Second draft in refining my concept. 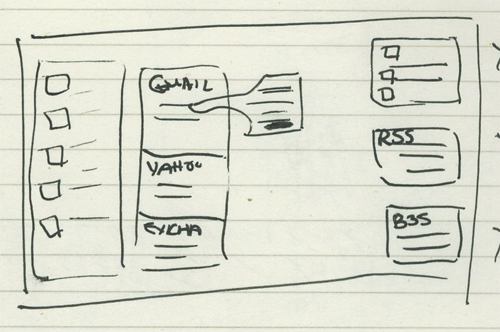 The real magic with iterative sketching is the additional ideas and troubleshooting that happens naturally. Within the span of 10 minutes, I was able to simplify visually, which gave me some guidance on, not only how I wanted to represent the concept but how I would slowly show complexity over time. Deciding what to show clients is a critical part of what we do, and finding it through sketching is a genuinely effective way to expose importance. Next post: It’s 2009. Are We Ready For the Next Disruptive Technology?